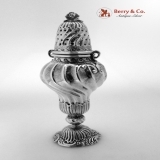 18th century sterling silver French Shaker with French and Russian hallmarks. The charge mark for Paris used from 1768 - 1774 and the maker′s mark T G under a Fleur de Lis are located under the base. Russian import marks are located along the outer rim. This special shaker has a conforming bayonet mount top and is 5 3/4" tall, weighing 120 grams or 3.9 ozs Troy ounces. The remarkable original condition and clear, crisp detail, with no monograms, removals, repairs or alterations, make this an especially attractive offering. The soft, warm, original finish is present, with no buffing or machine polishing. 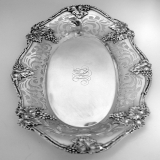 American Aesthetic Period sterling silver bread tray with lovely openwork and applied figural grape motif, beautifully crafted c.1910. It measures 12 5/8" in length, 7 3/4" wide and weighs 409 grams or 13.1 ozs Troy. It is mongrammed with the letters SHJ. The excellent original condition and clear, crisp detail, with no monograms, removals, repairs or alterations, make this an especially attractive offering. The soft, warm, original finish is present, with no buffing or machine polishing. 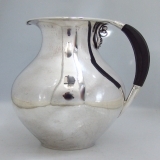 Danish sterling silver water pitcher by modern master silversmith Georg Jensen, c.1925. This unique and marvelous piece is a magnificent modern interpretation of a familiar item. It has the two elements that Jensen was famous for, clean geometric lines and inspired design. It stands 6 7/8" tall, 5 1/2" spout to handle and weighs 512 grams or 16.5 ozs Troy ounces. The remarkable original condition and clear, crisp detail, with no monograms, removals, repairs or alterations, make this an especially attractive offering. The soft, warm, original finish is present, with no buffing or machine polishing. 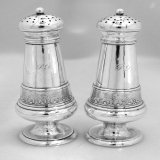 Antique American sterling silver salt and pepper shakers by John Wendt of New York c. 1865. They feature gorgeous die rolled decorative borders with scroll and foliate motif, elegant finials and round pedestal bases. They stand 4 1/4" tall and weigh 144 grams or 4.6 ozs Troy. Each has a period monogram PD on the side of the body. The impeccable original condition and clear, crisp detail, with no removals, repairs or alterations, make this an especially attractive offering. The soft, warm, original finish is present, with no buffing or machine polishing. 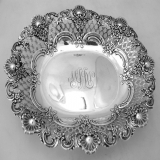 American Sterling Silver Aesthetic Period serving bowl, masterfully crafted by Tiffany & Co. of New York, c. 1900. This famous retailer and silver company is known for brilliant silversmiths and creating the most opulent and breathtaking sterling treasures of the American Gilded Age. This impressive piece is a gorgeous example of their style and features elegant openwork throughout, complemented by an exquisite scroll and floral motif. It measures an impressive 11 1/4" length, 9 1/4" width, and weighs 514 grams or 16.45 ozs Troy. It is mongrammed MWW on the underside. The exceptional original condition and clear, crisp detail, with no monograms, removals, repairs or alterations, make this an especially attractive offering. The soft, warm, original finish is present, with no buffing or machine polishing. 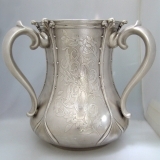 A loving cup is a ceremonial vessel used in weddings or banquets and popular in 19th and 20th centuries. It usually has two or more handles and symbolizes unity, love or friendship. This magnificent example of a loving cup was made by Tiffany & Co. of New York, c. 1906. It has a superb shape, lovely acid etched floral and foliate embellishment and simple decorative borders. It has three graceful applied handles and an inscription that reads: "JPW & JB November 5th 1856 1906" It stands 8" tall, 9" wide and weighs 1486 grams or 47.8 ozs Troy. The remarkable original condition and clear, crisp detail, with no removals, repairs or alterations, make this an especially attractive offering. The soft, warm, original finish is present, with no buffing or machine polishing. 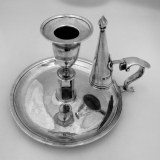 Henry Chawner was one of the earliest, and most prolific British silversmiths of the 1700â€²s. This exquisite 200 year old chamberstick, with matching snuff, is a magnificent example of the enduring quality and fine craftmanship that made him famous. It was impeccably made by hand in London, c. 1792 and bears all appropriate date, city and maker hallmarks. It measures 6 1/4"in length at itâ€²s widest point, stands 4 1/8" in height and weighs 230 grams or 7.39 Troy ounces. The remarkable original condition and clear, crisp detail, with no monograms, removals, repairs or alterations, make this an especially attractive offering. The soft, warm, original finish is present, with no buffing or machine polishing. 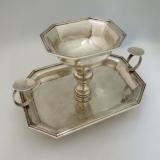 Impeccable handwrought Spanish Colonial silver braserillo, crafted c.1800. A braserillo (or brazier) is an elegant smoking accessory used in Spain, and her colonies in the 1800â€²s. A live ember is taken from the fire and placed in the bowl so it can be passed around to light cigars or pipes. This elegant and distinctive example features two handles that can also be used as a cigar rests. Uniquely octagonal in shape, this stately piece is complemented by it′s simple decorative matching borders. It measures 7 1/2" across the handles and stands 3 3/8" in height. The excellent original condition and clear, crisp detail, with no monograms, removals, repairs or alterations, make this an especially attractive offering. The soft, warm, original finish is present, with no buffing or machine polishing. 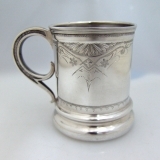 American coin silver baby cup with graceful curving applied handle,and brilliant brite cut designs. The upper and lower portions are also embellished with brite cut decorative borders. The patterns on front and back are superbly done were expertly crafted c. 1870. 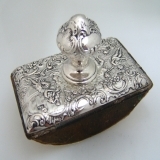 It stands 3 1/4" in height 2 3/4" in diameter; 4" across the handle and weighs 125 grams or 4 troy ounces. The excellent original condition and clear, crisp detail, with no monograms, removals, repairs or alterations, make this an especially attractive offering. The soft, warm, original finish is present, with no buffing or machine polishing. 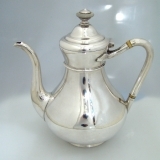 Substantial and elegant Russian 84 silver tea pot, expertly crafted in St. Petersburg, c. 1875. This noble 136 year old treasure bears all appropriate date and city marks. It′s form is almost scupltural with regal and graceful curves. From the round ample base and cheery spout, to the top of it′s domed lid, it is a warm, and inviting teapot complemented by a handsome finial, standing ready to brew your favorite Earl Grey or Russian Zavarka. This Russian charmer measures 8" inches in height, 7 1/2" wide from handle to spout and weighs a hefty 628 grams or 20.19 ounces Troy. The excellent condition and clear detail, with no monograms, removals, repairs or alterations, make this an especially attractive offering The soft, warm, original finish is present, with no buffing or machine polishing. French Louis XV oval meat platter with a triple threaded scalloped border and a 9 pointed crowne crest with 4 birds set into an X flanked by rampant lions, with the PAris Commune mark dating it specifically to 1745. The correct marks are present, with the assay mark, the Paris Commune mark, the Makerâ€²s mark OG and the running dog discharge mark. 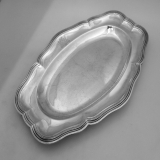 This scarce and desirable platter is 14" long, 9 1/2" wide and it weighs 683 grams or 22 ozs. Troy. Inscribed with the crest described above, the excellent original condition and clear, crisp detail, with no removals, repairs or alterations, make this an especially attractive offering. The soft, warm, original antique finish is present, with no buffing or machine polishing. 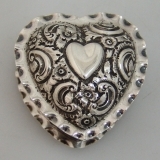 Precious sterling silver heart shaped box, embellished with charming floral and scroll repousse motif. Made in Birmingham, England c.1891. It measures 2 1/4" in length, 2" in width and 1 1/4" in depth. It weighs 47 grams or 1.51 Troy ounces. The excellent original condition and clear, crisp detail, with no monograms, removals, repairs or alterations, make this an especially attractive offering. The soft, warm, original finish is present, with no buffing or machine polishing. 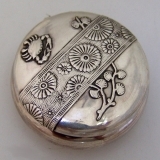 American Aesthetic Period sterling silver pill box with applied sea life decorations in the Japanese taste, c.1880. It has a diameter of 2" and stands 5/8" in height. It weighs 30 grams. The excellent original condition and clear, crisp detail, with no monograms, removals, repairs or alterations, make this an especially attractive offering. The soft, warm, original finish is present, with no buffing or machine polishing. 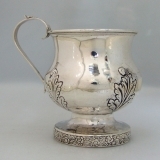 American coin silver baby cup with attractive repousse foliate embellishment, elegant pedestal base, floral respousse border and graceful curving handle. It stands 7/8" in heights and has a width of 4 1/8" across upper portion which includes the handle. It weighs an impressive 173 grams or 5.56 Troy ounces. The insciption reads "Thomas H Hewes from John H & Langdon H Haven October 1 1826" The excellent original condition and clear, crisp detail, with no monograms, removals, repairs or alterations, make this an especially attractive offering. The soft, warm, original finish is present, with no buffing or machine polishing. 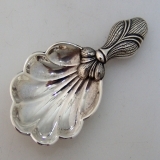 Beautiful hand hammered braserillo made of fine Spanish colonial silver, c. 1830. A braserillo (also called a chofeta or brazier) was a fashionable household smoking accessory in Spain and Spanish colonies throughout the 1800â€²s. An ember is removed from the fireplace or stove, then placed in the ember bowl so that it can be passed around to light cigars or pipes without burning the rug or table. This brasillero measures 8 1/8" in lenth, 2 1/2" in height and weighs 131 grams or 4.2 Troy ounces. It is marked Vega 18. The excellent original condition and clear, crisp detail, with no monograms, removals, repairs or alterations, make this an especially attractive offering. The soft, warm, original finish is present, with no buffing or machine polishing. Italian continental silver tea caddy spoon with an exquisite fluted bowl, lovely scalloped edged and magnificent little handle. Made by Buccellati of Florence, c.1960. This refined and stylish tea caddy spoon measures 2 2/8" in lenth and weighs 31 grams or 1 troy ounce. The excellent original condition and crisp details, with no monograms, removals, repairs or alterations, make this an especially attractive offering. The soft, warm, original antique finish is present, with no buffing or machine polishing. 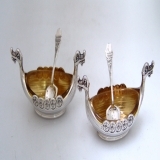 An exceptional pair of Norwegian Viking Longboat salt cellars in sterling silver, with liners and matching oar spoons, c. 1960. These minature ships are embellished on both sides with handsome Norse shields and imposing little dragon heads on both ends. The marvelous spoons feature a design of a longboat on the waves. The details are remarkably clean, and crisp. They each measures 3 1/4" in length, and each spoon measures 2 1/4" in length. The combined weight of spoons and ships (with salt liners removed) is 40 grams or 1.28 Troy ounces. The impeccable original condition and clear detail, with no monograms, removals, repairs or alterations, make this an especially attractive offering. The soft, warm, original finish is present, with no buffing or machine polishing. 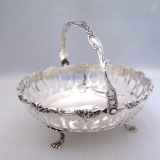 American sterling silver serving basket, masterfully crafted by Theodore B. Starr, New York c. 1890. This famous high end retailer and maker was known for expert craftsmanship and brilliant silversmiths who created some of the most stunning sterling treasures of the American Gilded Age. This gorgeous example of their style features a lovely body done in elegant openwork throughout, complemented by an exquisite scroll and floral motif applied border and a graceful swing handle. It stands on four applied figural claw feet which feature lattice and floral embellishment on the upper portion. It measures 4 7/8" in diameter, stands 2 1/4", without the handle and 4 3/4" when the handle is raised. It weighs 131 grams or 4 Troy ounces. The excellent original condition and clear, crisp detail, with no monograms, removals, repairs or alterations, make this an especially attractive offering. The soft, warm, original antique finish is present, with no buffing or machine polishing. 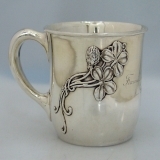 This beautiful sterling baby cup is a unique treasure because of the date inscribed and the applied four leaf clovers. Made by Shreve & Co, of San Francisco prior to the San Francisco earthquake and fire of 1906, it was a baptismal gift to "Francis Ryder Hannify" on November 28, 1906, just seven months after the fateful day. Four leaf clovers are a symbol of good luck with Celtic origins. What an appropriate gift for a lucky baby christening. A rare find, enhanced by itâ€²s unique history and aesthetic appeal. Itâ€²s inscription reads "Francis Ryder Hannify November 28, 1906." It is expertly crafted, weighs an impressive 125 grams or 4 Troy ounces of sterling, so it is substantial in weight for itâ€²s diminutive size. It stands 2 3/4" height with a diameter of 3", and measures 4" in width across the uppermost portion, which includes the handle. The excellent original condition and clear, crisp detail, with no monograms, removals, repairs or alterations, make this an especially attractive offering. The soft, warm, original finish is present, with no buffing or machine polishing. Nature, form and stunning workmanship come together in these exquisite Aesthetic Period nut dishes, c.1890 by George W. Shiebler and Co. of New York. 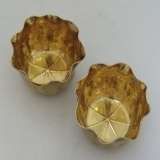 They are brilliantly detailed and complemented by a lovely gold vermeil interior. They measure 2" in diameter, stand 1" high and weigh a combined 42 grams or 1.35 Troy ounces. The excellent original condition and clear, crisp detail, with no monograms, removals, repairs or alterations, make this an especially attractive offering. The soft, warm, original finish is present, with no buffing or machine polishing. 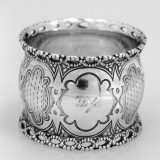 American coin silver round napkin ring c. 1860. This elegant, engine turned bellied body napkin ring has nicely detailed applied, open work, twisted rope borders. The large, shaped cartouche contains the inscription: Wife. Dimensions: 1 3/4" - 1 1/4", weighs 26 grams. The excellent original condition and clear, crisp detail, with no removals, repairs or alterations, make this an especially attractive offering. Monogrammed as described above, the soft, warm, original finish is present, with no buffing or machine polishing. Mexican sterling silver and rose wood gravy ladle by William Spratling Taxco Mexico c.1960. This handsome ladle measures 6 3/4" long. The excellent original condition and clear, crisp detail, with no monograms, removals, repairs or alterations, make this an especially attractive offering. The soft, warm, original finish is present, with no buffing or machine polishing. 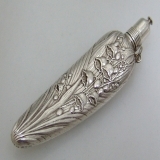 American sterling silver perfume bottle with Lily of the Valley decorations by Gorham Silversmiths, c.1885. This beautiful and unusual perfume bottle measures 3 3/8" long and weighs 22 grams. The excellent original condition and clear, crisp detail, with no monograms, removals, repairs or alterations, make this an especially attractive offering. The soft, warm, original finish is present, with no buffing or machine polishing. 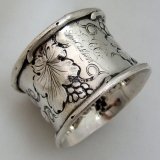 American coin silver grape repousse napkin ring from 1853. 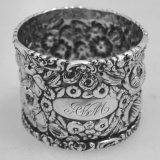 This beautiful napkin ring measures 2 3/8" - 1 1/2" and weighs 45 grams or 1.4 ozs Troy. The excellent original condition and clear detail, with no removals, repairs or alterations, make this an especially attractive offering. Inscribed AC April 24th 1853, and a later inscription ARC Oct. 17th 1903, the soft, warm, original finish is present, with no buffing or machine polishing. 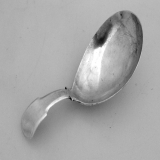 English sterling silver tea caddy spoon by an unknown maker, c.1800. This Feather Edge pattern tea caddy spoon has a shell form bowl and is 3 2/4" long and weighs 12 grams. it is unmarked, but guaranteed to be as represented. The excellent original condition and crisp details, with no monograms, removals, repairs or alterations, make this an especially attractive offering. The soft, warm, original antique finish is present, with no buffing or machine polishing. 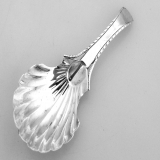 English sterling silver tea caddy spoon by Francis Powell, London 1824. It is unusual to find unmonogrammed tea cady spoons with no removals. I closely inspected the handle for any sign of a removal and found none. 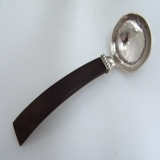 This attractive and highly collectible spoon is 3 1/8" long and weighs 11 grams. The excellent original condition with no monograms, removals, repairs or alterations, makes this an especially attractive offering. The soft, warm, original antique finish is present, with no buffing or machine polishing. 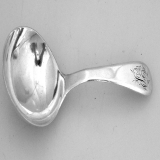 English sterling silver tea caddy spoon by Thomas Northcote, London 1792 . This attractive spoon has a period monogram P on the front of the nahdle and is 3 1/4" long and weighs 12 grams. The excellent original condition and crisp details, with no removals, repairs or alterations, make this an especially attractive offering. The soft, warm, original antique finish is present, with no buffing or machine polishing. 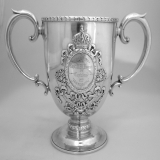 American sterling silver Spanish American War mustering out prersentation cup for the 2nd Mississippi Regiment in the Empire pattern by William B. Durgin Silversmiths of Durgin New Hampshire, 1898. 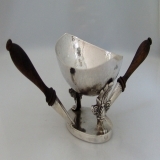 This ornate two handled cup was presented bt the Captains of the 2nd Mississippi to Captain W. B. Homer (6th Artillery US) on the ocassion of the mustering out of the 2nd Mississippi Regiment at Columbia Tennesse december (20) 1898. The names of all 12 Captains of Companies A through L are engraved in one cartouche, with the presentation to Captain Homer in the other cartouche. This highly desirable cup is 6 7/8" tall, 5 3/8" in diameter, 10 5/8" across the handles and weighs a susstantial 790 grams or 25.4 ozs, Troy. The excellent original condition and crisp detail, with no removals, repairs or alterations, make this an especially attractive offering. The soft, warm, original antique finish is present, with no buffing or machine polishing. American sterling silver Repousse napkin ring by Stieff, Baltimore, c.1910. This beautiful napkin ring measures 1 3/4" - 1 3/8" and weighs 32 grams or 1 ozs Troy. The excellent original condition and clear detail, with no removals, repairs or alterations, make this an especially attractive offering. Monogrammed AVM, the soft, warm, original finish is present, with no buffing or machine polishing.